Here’s a nice piece of old news which did the rounds in late May, concerning the façade of a luxury department store in Berlin, a famous brand of fashionable sports and leisurewear, and a graffiti artist. In honor of Lacoste’s 75th birthday, KaDeWe (Berlin’s answer to Harrods) invited the fashion label to celebrate in its department store. 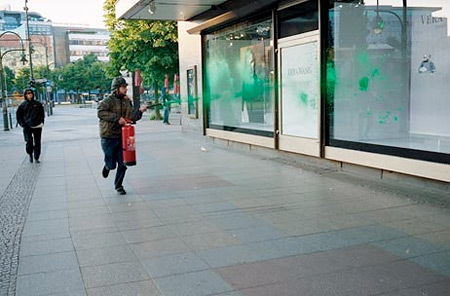 Then, under the title Â«12.12 GalleryÂ», Lacoste invited eleven artists living in Berlin to decorate the shop windows with original works of art which were then to be auctioned off for a good cause. One of these artists was Brad Downey, who, like his ten other colleagues, submitted a written proposal in which he made it quite clear that Â«something outside will turn greenÂ». So far so good. So on the 22nd May, Downy loaded up a fire-extinguisher with Lacoste-green children’s finger paint, approached the store front, and proceeded to give it a good dowsing. Shortly afterwards KaDeWe and Lacoste suffered from a sudden, synchronous sense-of-humour-failure. First the paint was removed as quickly as possible, and then Downey’s name dissapeared from the banner out front promoting the artistic intervention. There’s something deliciously embarrasing about Lacoste and KaDeWe’s behaviour in the aftermath of this event; something almost endearingly timid about their failure to distinguish between the artwork they commissioned and an act of stray vandalism. As a public relations excersize it pretty much capsized, and whilst Downey can claim innocently to have fulfilled his commission, it’s interesting to note where and how clearly the line has been drawn between the mainstream and the subversive. Bluntly said: put something daft behind a window and you’re okay; put something daft onto the window and you’re not. And this is a simple question of territory: of encroachment and of assimilation.